Drove like two crazy girls on Friday. Went from Woodland Hills, to Pasadena to drop off a birthday present, to Marina del Rey to get home repair products and then back home. On the way home, via PCH, we made a pit stop. When I hit PCH P starts saying “beesh! beesh!”. I pulled a U-ey and we got out to watch surfers and play on the beach. These are the moments I want to remember forever. The walk down to the water was on a steep stairwell that ended on a cement block. 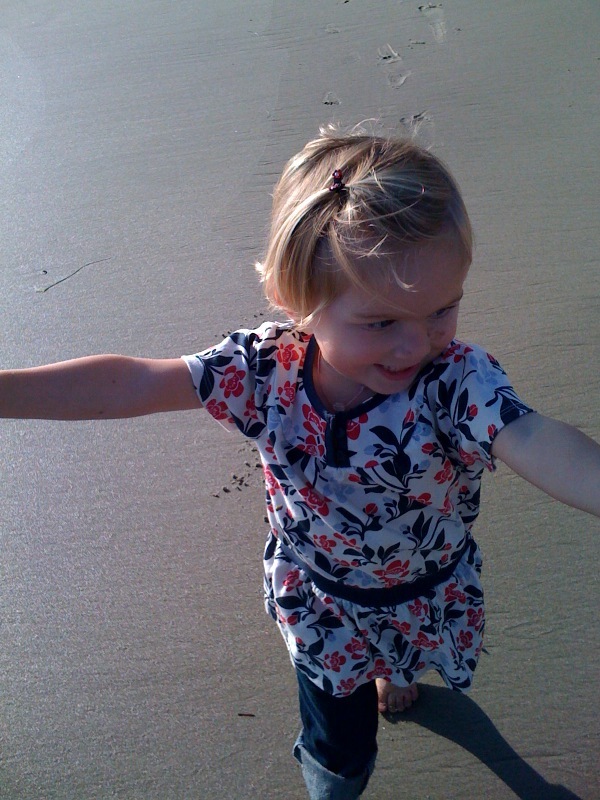 It was a jump to get down to the sand. 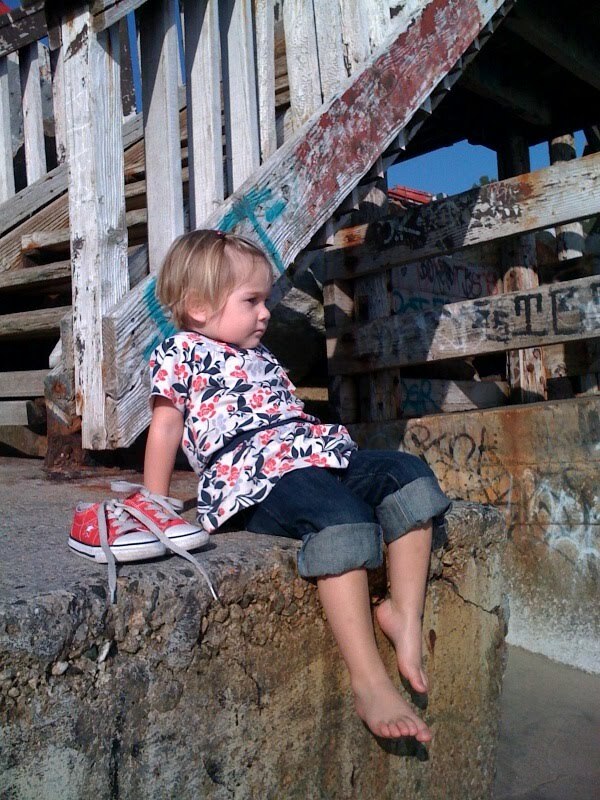 P wanted to sit and watch the surfers after I got her shoes off. First memory: P leaning back, super mellow, watching surfers intently. The graffiti on the rocks and stairs combined with the colors of her outfit were pretty cool. The picture captured California lifestyle perfectly. She is my California girl. P’s fear of the water on the beach went away after our visit to Florida in September. I now know what she doesn’t like is the temperature of the water. She’s right. It’s freezing. 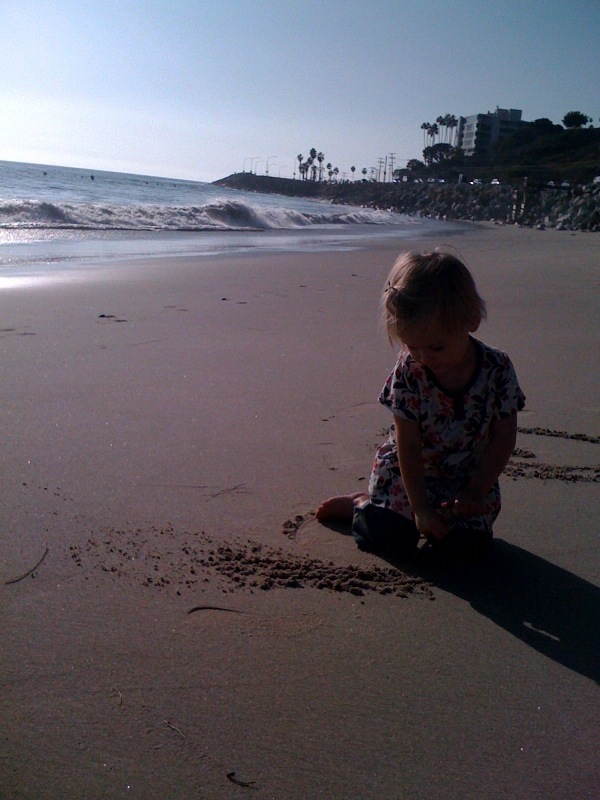 We walked on the sand for a bit. 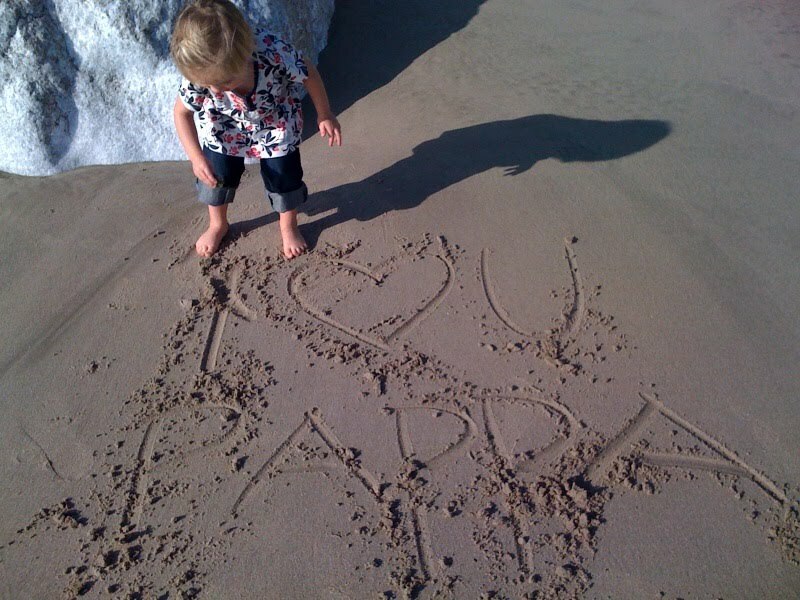 Then we wrote a message to Pappa and texted it to him. She climbed rocks and played with little ones. Along the way we ended up playing a game of chase and P trying to throw sand on me as I zoomed by her and grabbed her tummy or tushie. Second memory: P running like mad after me. The look of happiness on her face is worth every hard part of being a parent. Third memory: The hug and thank you I got from her when we made it back to the car. Somehow she gets that these are special moments and I’m glad. I know when I have a second child or when she goes to school our time will be more structured. These moments together are so so special and had I had our second child by now I would not have been able to experience this moment. I am grateful. Previous Previous post: She’s Singing!